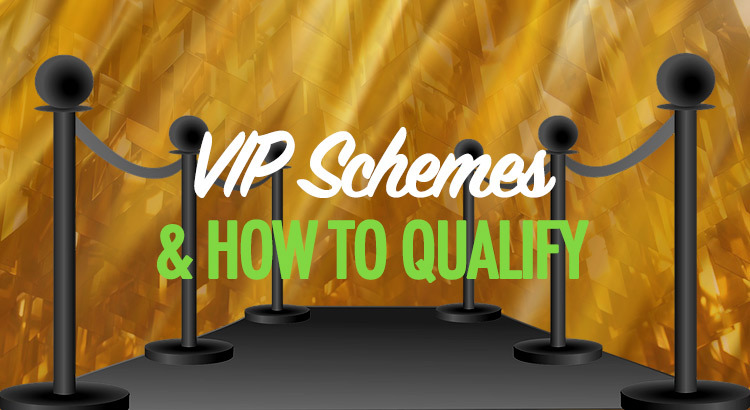 Bookmaker VIP schemes can be extremely lucrative for matched bettors. They will likely be unprofitable for regular high stakes bettors, although will appear amazing on the surface. That’s exactly why they’re designed – to tempt high earners to lose even more than they were previously over a long period of time. We here at Beating Betting, and friends of ours, have been VIP members at Coral, Ladbrokes, 888 and Betway, as well as various casinos. With that said, it’s probably fair to say that we know a thing or two about qualifying for VIP programmes. We’ve also had correspondence with multiple people that claim to be VIP members of Bet365, Betfred and other lesser-known bookies. Whilst we don’t have concrete evidence of these existing because we’ve not been a part of them ourselves, we’ve had enough discussion around qualification, account management and the types of offers received to say with some confidence that they are, or were, almost certainly real. Let’s dive in to telling you exactly how you can be invited to VIP status. Why Are VIP Schemes so Lucrative? Being a VIP gets you access to offers that regular customers can only dream of. In one month of Coral VIP (Gold status) in 2017, I managed to pick up over £1,200 in casino EV alone. On the sports side, there were £250 free bet refunds, up to £1,000 free bets on their ‘Win, Win, Get In’ promotion and various other weekly rewards including additional offers and outright free bonus money. If you doubt that it’s possible to make over £1,500 in a month of matched betting, a single bookmaker VIP scheme could give you access to those figures. Whilst they can be slightly time consuming to achieve and maintain, most people in this position also still have time to commit to offers on other bookmakers and casinos on top. Can You Last Long-Term as a VIP? If you’re a loser, yes. Not personally, or socially, but financially. If you lose a lot of money and don’t know how to take value then you could remain for a lifetime as a VIP if you kept up the big betting habit. Realistically, as a matched bettor, lasting forever would be impossible. 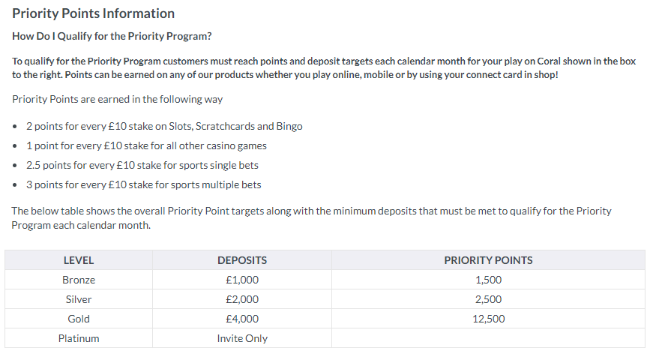 Priority player accounts can be put under even more scrutiny, although it does depend on the bookmaker or casino in question. You will likely have an account manager looking after you, and it’s not as if these account managers are going to be judging whether you’re a matched bettor or not, but it does show the extra resources they will commit to you as a VIP player. It’s only fair to assume (and we know from experience) that these accounts will be watched more closely in multiple ways, with profitability to the house the most obvious of those. However, smart mug betting and thinking outside the box can allow for your account to stay in good standing for longer – this isn’t just true for gubbings but also for staying inside high value loyalty schemes. Most sites keep their entry criteria a secret. To summarise from the chart, in order to hit the minimum (Bronze) level of VIP status, you must deposit at least £1,000 in a month and earn at least 1,500 priority points. Important note: From experience, you have to beat the targets, not just meet them. Depositing more than the required figure and betting more than the required target is almost essential. These points could be earned from spending £6,000 in sports single bets, slightly less if you choose multiples, or £7,500 on casino slots. This seems like a lot, but can be broken down to £200-£250 per day. Needless to say, it can be quite a costly investment in terms of time and actual expense in order to meet the goals. If you bet £6,000 at an average odds match of 1.8 / 1.85, used purely for example and you should arguably take slightly worse, and assuming 2% commission, that will lead to a minimum qualifying loss of £216.39. You also need to mix up your style, your bets and be unpredictable; it’s not unlikely that you will be gubbed in your VIP quest – so think smart so that it won’t be obvious to either a robot or a manual trader. Betting £1,000 on a low odds, pre-game perfect odds match might give you a boost in the hunt but it will also give you a big red flag on your profile. If you were to turn over £7,500 on a 96% RTP slot, that would lead to a £300 expected qualifying loss based on EV. It could be drastically more or less depending on variance. Casino does give the benefit that it takes less time to hit the targets as you can leave a slot spinning in the background. Going with this method requires a large bankroll and a mentality capable of dealing with a downswing. Generally speaking, a large investment of time and money is needed across sports singles, multiples, in-play bets and casino. This might seem like doom and gloom; a lot of expensive work and a big risk. Well, that may be true. But at least we know the criteria. And should you make it into the VIP scheme, it gets much easier to maintain and re-hit the targets. This is because you’ll be playing with your own money much less often; free bets and bonuses make it much easier to retain the points for the following months, often in significant profit. In fact, the thing that can become difficult is continuing to hit the deposit targets. A lot of people start winning so much money from the VIP offers (when they know how to exploit them) that deposits wouldn’t be necessary if they weren’t needed to maintain VIP status. Some clever withdrawals and redeposits may be required. Most bookies aren’t as transparent as Coral. Side note: Ladbrokes have exactly the same criteria as they’re the same company. The following tips will allow you a fighting chance of qualifying for VIP with Coral, Ladbrokes and various other bookmakers named in this post…and perhaps some that aren’t. Bookies want to make sure that you’re regularly putting in fresh money to ‘lose’ each month. Hopefully you can do a good job of winning your money into the exchange – this obviously requires some luck but can be done with some skill, too. Deposit every month and in decent figures. Don’t make it a set routine; keep the timings varied where possible. We already know from Coral’s criteria that they require a minimum of £1,000 each month for bronze status. Expect all other bookmakers to be the same or higher. Withdrawing isn’t amazing when on the charge for a shiny new VIP account. Sometimes they are an inevitability. If you can’t avoid it, don’t worry, withdraw some. A regular punter would withdraw some funds if they were on a winning streak. But for the sake of the reputation of your account, don’t go overboard. A true VIP would be betting big and betting often. You need to do the same to act like one and blend in. However, if there’s no major sporting event on, don’t be in a rush to find a bet just to keep your account ticking over. Most VIPs won’t be betting on random foreign leagues for the sake of it. They bet on big teams and big events. On days where the Premier League is on, or Champions League, a big horse racing meet, Wimbledon – anything which the general public would typically be interested in, that’s fine to bet on. The minimum stake for ‘high roller’ bets? Whilst there is no set rule, we’d advise somewhere in the region of £25 for multiples (larger accumulators) and anywhere up to £500 if you’re betting on doubles. The fewer selections in the bet, the larger you can generally bet. Singles should generally be £100+, depending on the odds, and anywhere up to £1,000. It can also be worth trying to scale your bets up over a period of time, rather than creating an account and instantly betting thousands each week. Don’t go throwing huge amounts of money on really low odds. Not all that many VIPs are interested in huge risk for little reward. They want at least some thrill of a win for their investment. It’s also a standout for the bookmaker; they know you won’t need much money to lay huge bets at low odds off. Try to avoid odds of 1.4 or less, although you can opt for them if truly necessary (i.e. to qualify for an offer). Don’t stick to the same type of bet – many people will stick to pre-match or pre-race singles because they are the easiest (i.e. laziest) things to do. Don’t be lazy, it won’t cut it. Singles, doubles, trebles, accumulators, lucky 15s, heinz bets, in-play, and that’s just some of the sports. Slots, blackjack, roulette and more. Don’t overdo it on casino because you’re throwing EV away and accepting variance, but it can do wonders for making your account profile look like a mug so mix it in weekly. Betting in-play is something almost every mug bettor does these days, and to become a VIP you’ll need to be doing it yourself. And the ‘match result’ market won’t cut it on its own. Throw in some others where possible too. Top tip: You can sometimes find dutching arbs where one bookmaker will price up an in-play market at one price and another bookmaker will price it up completely differently, giving you a chance at profit. These are rare, and arbs are generally bad to take, but in-play markets are much more difficult to be tracked compared to arbing on pre-match markets. This isn’t a tip for VIP qualification, but it’s an extremely important thing for you to be able to do during your attempt to qualify or after you successfully qualify. UK law requires bookmakers to ‘Know Your Customer’, meaning they need to be able to prove you are who you say you are and that you’re betting with money that you have in your possession legally. When you start to bet in bigger volumes, it’s a case of ‘when’ rather than ‘if’ you’re required to prove your source of wealth. Usually, these require payslips, bank statements, or other forms of proof of income. If you are matched betting full-time then you will need to consider in advance how you go about proving this income as and when the time comes.